Economics in EU4 revolves around the earning and expenditure of ducats, the game's international currency. The national and international economy underpin almost every function of a country, and often fuels international diplomacy. Understanding and developing a country's economy yields better national finances, allowing the country to boost its standing in the world and further grow at a faster pace. 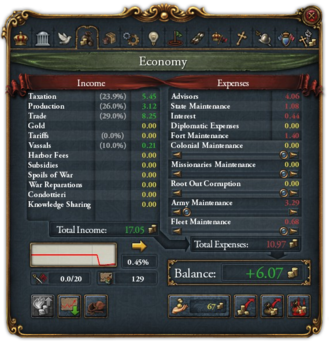 The Economy panel in the Country interface displays a summary of the player's finances and provides a few important actions relating to it (such as Loans and Reduce Inflation). The total amount of ducats in a country's treasury is updated at the beginning of every month. The amount by which this changes is the total income minus the expenditure for the previous month. The various factors which affect these amounts are listed below. In addition, various events may add or take away from the treasury. The "Income" column lists regular streams of income, and effect by modifiers plus efficiency (in grey, middle column). Income is the sum of all money gained monthly. Unlike in EU3, all income is liquid and does not need to be minted. The continuous sources of income that a country has is listed in the "Income" column, which is on the left side of the Economy panel (see right). This panel lists both the total amount from each source and that source's bonus (if any). Hovering over the source or bonus shows a tooltip with detailed information, such as modifiers or a breakdown of income by province. The maximum amount of ducats a country can have in its treasury is 1 million. However, this number is considered to be difficult to reach without using console commands or mods. Tax comes directly from the population of a province, and produces a relatively dependable baseline income. Each province has a base tax (which may be increased by spending administrative power), and a tax income efficiency. The yearly province tax amount is the multiple of the two amounts. There is also a National Tax Income, that is calculated at a countrywide level. Various tax modifiers exist that may change this amount. Production is a measure of the amount of income generated in a province by local producers of its trade good. Unlike in EU3, production income is added directly to the state's income each month. This amount depends on the good's prices, the province's base production, and the production efficiency (among other modifiers). The trade value produced by each province flows into the trade network, where it is eventually collected by capitals and merchants and converted into ducats. Careful management of trade can make it the most powerful source of income by far, which makes control of trade-important provinces instrumental for a long-term increase of a nation's economical power. Gold is a special "trade" good. Gold does not produce any trade value; instead, it is converted directly into ducats. Gold production income is 40 ducats per year per unit produced, with the exception of unreformed New World natives, who only receive 1 ducat per year per unit produced. Income from gold causes inflation per year equal to half its proportion of the country's income; at 100% income the country's inflation would increase by 0.50% per year. Available only with the El Dorado DLC or the Golden Century DLC enabled. Colonial nations with gold provinces will not receive the income of gold for themselves, but instead will store it in a ‘Treasure Fleet Counter’ that counts up towards a certain sum depending on the size of the colony’s gold mines. Once the counter is full, the colony will send a treasure fleet. The treasure fleet travels downstream along the trade routes, passing each node between the colonial nation and its overlord's trade capital. If there are privateers present in these nodes, they will steal a share of the gold corresponding to their power in the node. At the end of the journey, any money that remains is given to the overlord nation, which will suffer inflation similar to that gained from gold mines. Nations who do not have their trade capital downstream of their colonies’ trade nodes will be unable to receive treasure fleets. In these cases, the colonial nation will simply keep the gold for themselves, paying just the usual amount in tariffs. 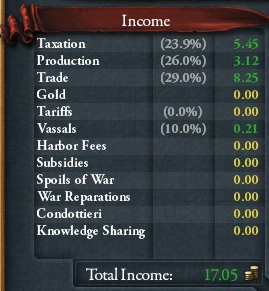 Colonial nations are required to transfer a part of their total income, called tariffs, to their overlord. At their formation, this amount is 10% of their income. 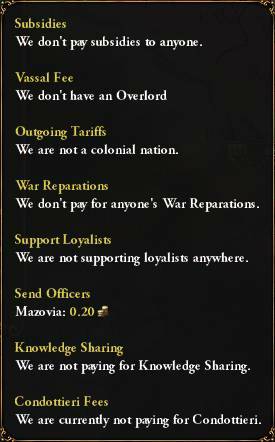 The tariffs can be set for each colonial nation by the overlord in the Subjects interface or may change through events. Higher tariffs increase the level of Liberty desire in the colonial nation. Vassals are required to pay a fee to their overlords. The basis for calculating this fee is the tax income of the vassal. The amount that must be paid is modified by the ‘vassals tax efficiency’ of the overlord, which is influenced by the overlord's legitimacy, among other factors. Apart from the fee, vassals may be requested to give all of their trade power to their overlord. While this action will increase their liberty desire by 30 %, this may boost significantly the overlord's trade income, especially if he has better trade efficiency. Signing a fleet basing agreement with another country will cost an amount equal to 0.1 ducats per month for every port belonging to the other country with a minimum of 0.5 ducats and maximum of 2.0 ducats per month. The AI never asks to access ports of the player, and the player can never offer it (there is a -1000 "strategic interests" modifier). Whether the province is cored or not has no effect on the cost of fleet basing rights. Countries that have a strategic interest in another country may grant subsidies to that country, which is given in the form of a certain amount of the benefactor's monthly income each month for a certain number of years. Looting: Looting occurs when a province (either occupied or besieged) has hostile units stationed in it. Each province has a loot bar that depletes based on the amount that the army can loot every month. Privateering: A country can send their light ships on missions to Privateer in certain sea zones, aiding pirate nations in exchange for a portion of their earnings. A country has the option to demand 10% of an enemy's income for 10 years as part of a peace deal. It is possible to offer a country Condottieri, which are armies rented out for money. Note that, in the event that the contractor is a player-controlled country, the army will stay under the control of the AI. Available only with the Rule Britannia DLC enabled. A country may offer other countries progress in institutions they haven't yet embraced. This costs 10% of their monthly income, which they pay direct to the country that's sharing. Only one knowledge sharing agreement may be made at a time. The "Expenses" column showing major payments and maintenances. Automatic expenses: These are expenses which are automatically deducted from the treasury. They cannot be modified from the Economy panel, simply viewed (except for Interest, which may be changed through the Loans interface). Adjustable expenses: These expenses are shown with sliders, to adjust the amount being spent monthly on them. Changing these expenses using the sliders will have an impact on the action being done or the asset being maintained. Advisors have a base monthly salary equal to the square of their skill level, increased by 0.5% per game year since 1444. Hovering over this in the Expenses column shows a tooltip that lists other modifiers, including Inflation. States require continuous monetary upkeep, depending on the development of the provinces, the distance to the capital and further modifiers. Interest must be paid on loans. The default interest rate is 4%, which may be changed by modifiers. Further information is given in the Loans section below. Subsidies: Ducats sent monthly to other countries as subsidies, if any. Vassal fee: If the country is a vassal, the amount of vassal fees sent to their overlord. Outgoing tariffs: If the country is a colonial nation, the amount of ducats paid to their overlord as tariffs. War reparations: Amount paid to winners of previous wars (usually 10% of income for 10 years). See war reparations for more details (Requires Art of War DLC). Support loyalists: Amount spent to junior partners in Personal unions to reduce their Liberty desire. Send officers: Amount sent to marches to reduce their liberty desire and provide a bonus to their armies. Knowledge sharing: Amount sent to subjects to spread institutions. (Requires Rule Britannia DLC). Condottieri fees: Amount paid to other countries as rent for Condottieri (requires Mare Nostrum DLC). This shows the amount spent monthly to maintain the forts present in a country. The amount spent on each fort depends on its fort level. Forts can be mothballed while at peace to reduce their maintenance by a -50% modifier. Doing so will inhibits the forts upkeep of army tradition and remove the defenders making it easy to conquer in a war. Further modifiers are granted by ideas and policies among others. Thus, a 5 development province will cost about 2.10 ducats per month to colonize, while a 6 development province will cost 2.12 ducats per month. The cost is further increased quadratically for each colony over the number of colonists the country has. 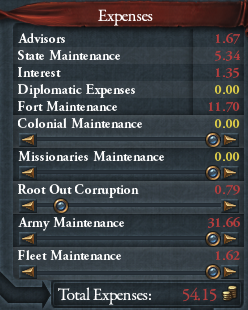 Colonial maintenance can be reduced, but at the cost of colonial growth. Provincial modifiers to colony growth are applied separately to this change. So, a tropical colony will shrink by -110 settlers with zero maintenance due to the additional -10 settlers provincial modifier. Colonial maintenance also does not affect growth from colonist agents. Colonists cannot be sent while a country is bankrupt. 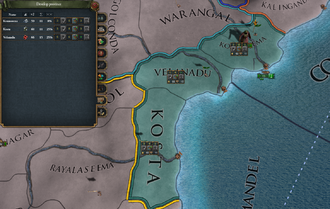 At the 1444 start, each active missionary costs 5 ducats per year at full funding. This base value changes over the years. Reducing missionary maintenance reduces missionary strength. Corruption cost multiplier is the amount spent per effective development. This is the amount that is controlled by the slider. It can be changed from 0 ducats per month to 0.05 ducats per month. Local autonomy is used in decimal form in the above calculations. The calculations above mean that higher local autonomy will decrease the cost of lowering corruption. At full army maintenance, each fielded regiment has a monthly maintenance cost equal to 2% of its recruitment price. All modifiers to maintenance are added together and applied to this. Reducing army maintenance using the slider affects reinforcement rates and morale, to 0% reinforcement rate and a -100% modifier to morale at minimal funding. Condottieri reinforcements and maintenance costs are applied even when maintenance slider is at zero. Maintenance costs increase over time as a country advances in technology. Maintenance costs will reduce when a regiment suffers casualties, but will increase due to an added cost for reinforcement. Maintenance costs will also increase when a country exceeds its force limit. First, naval maintenance increases at discrete steps rather than continuously. It is increased by 10% at Diplomatic technology levels 3, 5, 9, 15, 19, 22, 25, 27, 29, and 31 (to a total of +100%). Second, each vessel type has its own maintenance modifier. Third, vessels do not cost increased maintenance to repair, but also do not cost reduced maintenance if damaged. Further differences, including those on how modifiers are applied, are listed on the Navy page. If the Art of War DLC is enabled, mothballing allows naval units to be left unusable in a country's docks for lower maintenance, while giving ships 5% hull damage per year of being mothballed. Acquiring the National Bank idea in the Economic idea group can trigger an event in which loans can be changed to grant money equal to 6 or 24 months' income. A loan may be taken at any time, although each loan taken increases inflation by 0.1. A loan may be paid back in full, plus the total remaining interest owed, at any time during the loan period. If a loan expires and the borrower cannot (or chooses not to) pay the principal, the loan will be extended for an additional 5 years at the current interest rate, and inflation will increase by an additional 0.1. Loans have a default interest rate of 4% per year, paid monthly. The interest rate is influenced by the following factors. Note that these add to or subtract from the base 4%, so for example " −1% interest per annum" with no other modifiers results in an interest rate of 3%. The minimum interest rate that has to be paid is 1%. Countries that have a strategic interest in another country's wars may grant loans to that country. With Rights of Man active, rulers with the Indulgent trait will accept loans from Human Players if needed. The interest rate of loans from countries is set by the country granting the loan. If the borrower refuse to pay the principal when a loan expires, the lender gets a 12-month CB "Cancelled Loan" against the borrower. Debasing currency gives the player a loan's amount of money at the cost of 2 corruption. It cannot be done if corruption has already reached 90. This is useful if the player wants to repay it over time at their pace (not receiving even more inflation for re-newing loans); however, it is a lot more costly than a regular loan, costing around 60% of its value to be repaid using only "Root Out Corruption", plus the negative modifiers for having corruption, but the value to root it out can be reduced significantly if the player is ahead of time on diplomatic and/or administrative technology, and if its ruler has the Incorruptible trait, giving a "negative" interest if the player is willing to wait for it to decay naturally, with the only penalty the positive corruption effects. If the combined monthly interest of loans exceeds a country's monthly income, the country will be forced to declare bankruptcy. It is also possible for any country with at least one loan to manually declare bankruptcy. Deliberately going bankrupt, though dangerous, can be a powerful tool for restoring the economy if managed carefully. Try to have truces lasting at least 5 years with as many dangerous neighbors as possible, so they can't attack during bankruptcy. Before declaring bankruptcy, spend all monarch points on developing provinces or boosting stability (to at least +1 - less will be wasted), as they will all be lost otherwise. Ensure that no provinces are in the process of being cored. Colonies should be abandoned unless very close to completion. Rebels are more difficult to fight while bankrupt due to the penalties to army morale, but can be beaten with enough numbers. Since manpower gain is almost zero during bankruptcy, it may be necessary to re-hire mercenaries to fight them. Get stability back up as soon as possible and also consider spending military points to raise legitimacy (requires Rights of Man DLC). In economics, inflation is an increase in the price of goods over time. In gameplay terms, inflation makes all expenses cost more. Low levels of inflation (around 10%), though not ideal, are reasonable. Around 20% or higher, this could signify an economic catastrophe, and measures must be taken to avoid total collapse. However, as soon as inflation is 5+% its possible to get bad events because of the high inflation incurring stability drops or increased local autonomy. Contrary to real life, inflation in game does not mean constantly increasing prices, but rather a flat increase of the country's expenses. In real life certain incomes would increase with inflation as well. This reflects that the in game "ducats" have a constant value over the course of centuries and serve as an absolute indicator of value. The in-game inflation simply represents the inflation over the time between collecting income and spending it, therefore representing that the income has lost value while it was sitting in the country's treasury. Each loan taken or extended increases inflation by +0.10. Income from gold increases inflation by 0.50 per year times the proportion of income from gold. Lump sums of monetary compensation claimed in a peace treaty (but not reparations) cause a one-time increase of inflation. Various events can increase inflation. These are all situations where the country's money supply is expanded. In economics, an expansion in the supply of money without corresponding economic growth causes a decrease in its value, i.e. inflation. Before the middle of the 20th century, and certainly during the period of EU4, currency was only considered money to the extent that it was either made of or backed by gold (and silver, which is represented by gold in the game), which is why gold income (a direct injection of pure money) causes inflation. Several effects reduce inflation over time. Furthermore various events, decisions, triggered modifiers and mission rewards can affect inflation. If passive means are unavailable or insufficient, the Reduce Inflation button in the budget panel reduces inflation by −2.0 in exchange for 75 administrative power. ↑ 1.0 1.1 1.2 1.3 1.4 1.5 See in /Europa Universalis IV/common/defines.lua. ↑ See in /Europa Universalis IV/common/static_modifiers/00_static_modifiers.txt (Static modifiers#Bankruptcy). This page was last edited on 3 April 2019, at 21:51.